Like the drivers who tend to favor off-road-ready SUV models, the 2019 Toyota 4Runner enjoys spending most of its time off the pavement and in nature. With available specialty features including a high ground height, a power rear window, and sliding rear cargo deck, the 2019 4Runner lineup brings a lot of performance and capability features to the table that help drivers make the most of their adventures. For 2019, the Toyota 4Runner lineup adds an updated TRD Pro trim that includes premium off-road performance amenities and an available SX Package that adds blacked-out design elements for a custom look at the fraction of the price. Learn more about what the 2019 Toyota 4Runner has to offer below, then visit Fox Toyota near Knoxville, TN to see it in person. 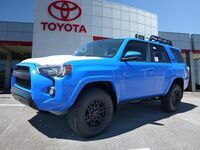 With seven available trim levels and even more add-on packages and upgrades, the 2019 Toyota 4Runner lineup has a model built to suit everyone’s needs and budget. Get a taste for what the Toyota 4Runner has to offer with a quick rundown of key specs for the 2019 model year below. Doing online research is a great first step for car shoppers trying to narrow the models they are interested in. But, nothing beats seeing the model in person at a local dealership and getting behind the wheel with a test drive. Knoxville-area drivers can find the 2019 Toyota 4Runner lineup available now at Fox Toyota in Clinton and can schedule a test drive in person, by phone, or via the pop-up form below. Interested in a 2019 Toyota 4Runner?